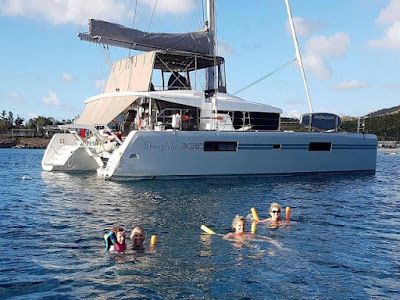 We have just received a review from recent guests who chartered the catamaran Shangri-La, a 52-foot Lagoon catamaran that accommodates up to 8 guests. 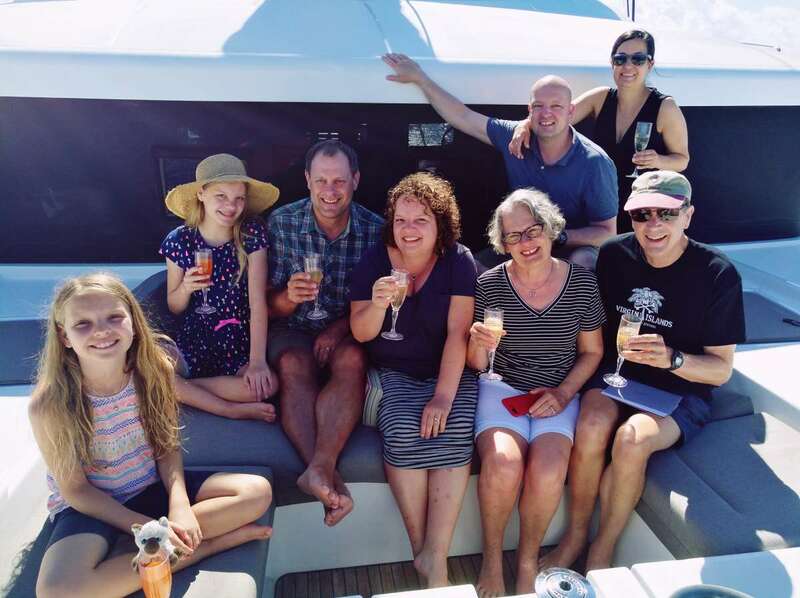 The excitement of the trip was defined by my previous experiences with sailing trips like on the Shangri-la so I thought I knew what to expect, boy was that a mistake…. Upon arrival you realize you are in a special place, someone’s beautiful home meticulously maintained and perfectly appointed; no detail is forgotten, and no luxury spared. You are greeted warmly by your Captain Bernd, your chef Daniela and your “stew” Ursula; immediately you know you are in for an exciting week. After the safety briefing and rules of the house, it is time to get settled in your beautiful room with en-suite bath equipped with a separate shower, individual air conditioning controls and a very comfortable bed (be sure to look under the towels for your own sleep cover because there IS one for each of you). Pack away your duffle (don’t bring an actual suitcase because you are on a boat, there isn’t a ton of storage) and settle in for your first meal because everyone is ready to get into the sun and jump into the crystal blue waters; you feel at home immediately. 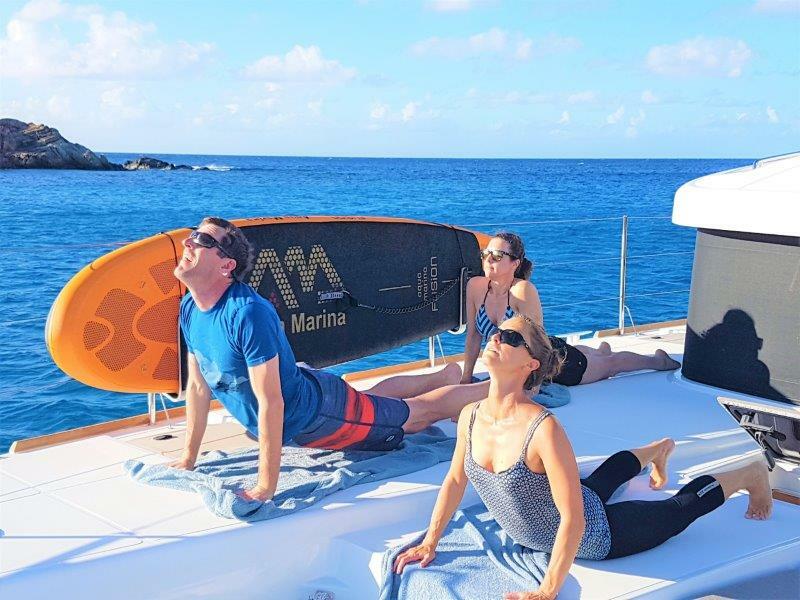 Grab a snorkel, sit out the floating island, tackle a stand-up paddle board or hang on a noodle off the back; there is no shortage of water accessories for you to enjoy. When Bernd suggests the “subwing”, don’t ask just trust him; grab a snorkel mask and jump in the dinghy quick!!! By the time you have exhausted yourself in the sun, it is time for cocktail hour! 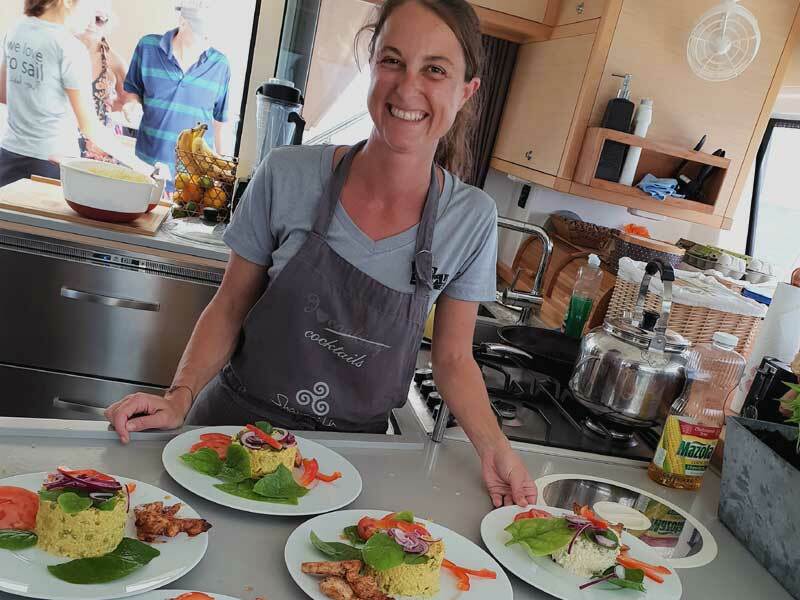 While enjoying the sunset and relaxing after a day in the sun, there will be light hors d'oeuvres and drinks provided to stave off your hunger before dinner. 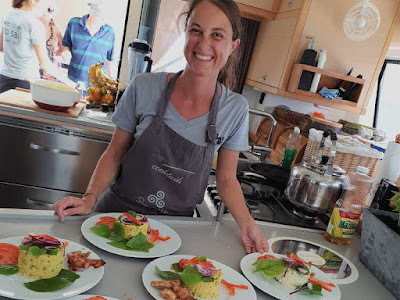 Daniela prepares everything from a mixture of canapes consisting of truffle, exquisite cheeses, salmon, avocado, etc. to chips and quac/salsa while Bernd makes sure you have a specialty cocktail to accompany your snack perfectly, what a perfect team these two make! When I say Daniela is a chef, I mean she really is a chef. Her meals are created with love and precision, presented with thought and flavored with perfection; if you believe as I do that you eat first with your eyes, you won’t be disappointed. Every meal is followed by a dessert that cannot be turned away, hand made by Daniela with passion and imagination. From Oma’s red wine cake to authentic apple strudel, the memories leave my mouth watering. So many things to say about Bernd. Drinks, Karaoke master, captain, workout coach, joke teller, grill master, mixologist, drone pilot, videographer, safety expert extraordinaire. 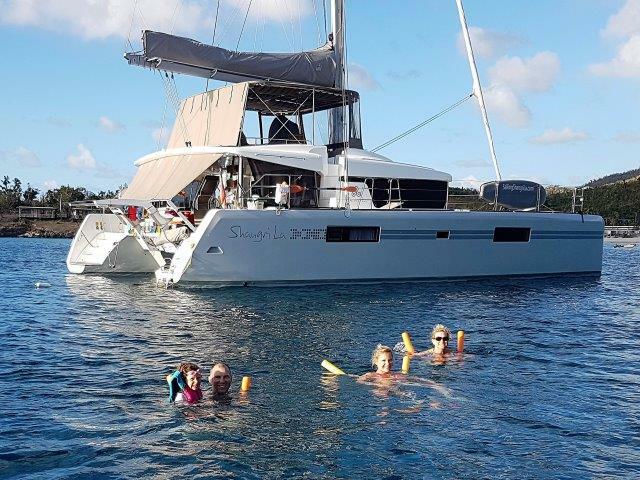 Always ensuring you are safe, comfortable, happy and sailing to the most perfect place for whatever activity you are in the mood for (or not in the mood for); he is so knowledgeable about sailing, weather, the islands and cocktails. Bernd makes you feel safe, happy and content every second of every day of your trip. He goes the extra mile all day. Every day. Let me wrap with Ursula because she, too, will absolutely be someone you don’t forget. She is always hanging in the background ready to give you whatever you need even though you may not know what you need at the time; always with an energetic smile but never in an intrusive manner. Waitstaff in fine dining restaurants or members of a hospitality team can take a page from the book of Ursula…. Emerge from the water, she is standing there with a towel. Changing your swimsuit and need somewhere to put it? Ursula will take your suit from you and it is magically cleaned of saltwater, dried and ready for you the next morning. Laying in the sun taking your last sip of your drink, she approaches from seemingly nowhere with another. Having dinner? She is ready to clear your plate or pour your drink, she is there like magic. Do you need more food? Something in addition to what you have been provided? Ursula is there to get it for you. I could go on and on about the soothing tone of Daniela while leading a yoga session (I didn’t even participate but I felt super relaxed just listening to her), the continual drive for perfection of Bernd (always making sure you have what you need or want), and the desire to meet every need by Ursula but I think I will leave something to the imagination. 15% OFF any charter booked to take place in April or May 2019. Must begin and end in Red Hook, St Thomas. May not be combined with other special offers. 5-night minimum. Expires May 31, 2019. 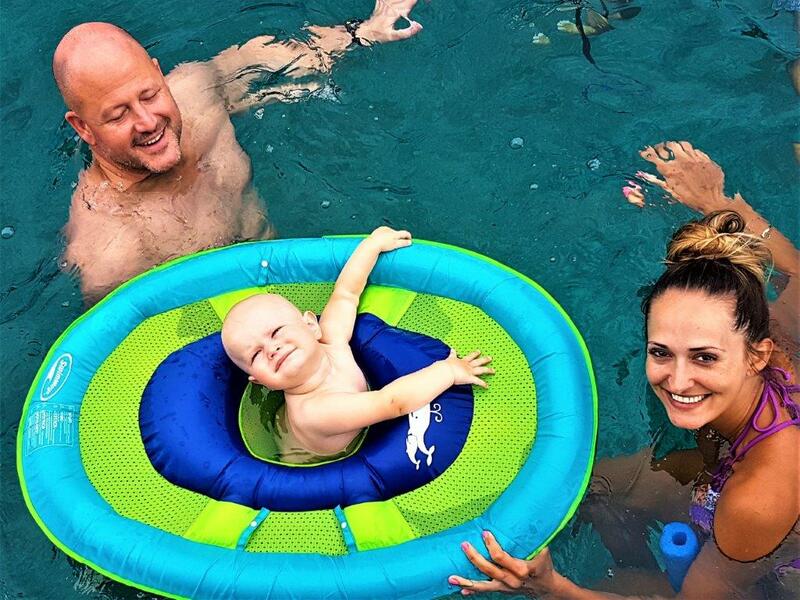 BABIES: Babies of all ages are welcome. No charge for babies under 12 months if guests bring all supplies or reimburse boat for items purchased specifically for the baby. 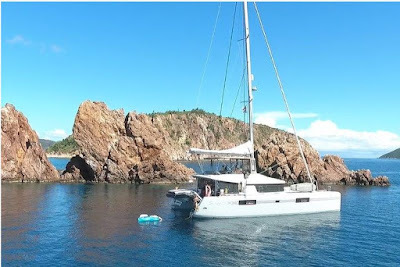 Shangri-La is a 52-foot catamaran with a crew of three. This is a very comfortable yacht and has many lounging areas: forward "cockpit" behind trampolines, aft cockpit, interior salon, and the flybridge. 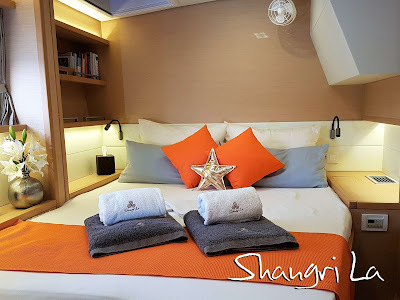 Shangri-La is fully air conditioned and accommodates up to 8 guests in 4 cabins. The master cabin has a queen berth, private en-suite bath (electric-flush toilet, wash basin and large stall shower), lots of storage and separate access directly to the aft deck. Two large queen cabins each with private en-suite bath (electric-flush toilet, wash basin and stall shower), plus one cabin with two single upper/lower bunk beds (6'8" long, suitable for adults) with private en-suite bath (electric-flush toilet, wash basin and large stall shower). ON SPECIAL REQUEST: they can offer 8 guests in 4 queen cabins and crew will move to bunk cabin for added $2,000. Shangri-La has a 14-foot dinghy with 50HP motor, tube, wakeboard, 2 standup paddleboards (SUPs), 2 kayak paddles to use SUP as kayak, snorkel gear, floating mats, noodles, floating lounge, pool bar, beach games, bocce balls, football, frisbee, TV/DVD in salon, karaoke, iPod dock, onboard wifi where available, underwater camera, European coffee and espresso machine, etc. No fishing, please. Perfect yacht for charters of all ages.